The things you see during a silent film show when you’re the one who’s closest to the screen! As a film accompanist, I’m constantly scanning the frame for information while I’m playing. Impending story developments can be introduced in different areas of a shot while other action is happening in the foreground, and I like to catch something before the audience sees it, so my score doesn’t lag. Sometimes I spot oddball trivia that’s useless. Yesterday I spotted something a little more interesting. One of the programs in the Silent Comedy International series at MoMA entitled “Fred Karno’s Army” features comedians who were alumni of Karno’s company. The Fred Karno Company was sort of the Second City of the English Music Hall in the turn of last century, producing sketches and touring companies of its repertoire as well as serving as a training ground for its wordless slapstick comedians. Our film program includes a 1914 Keystone comedy Making a Living, the first film starring Karno alum Charlie Chaplin. He’s right off the stage, recently plucked from a U.S. Karno tour, wearing a get-up that renders him nearly unrecognizable and is probably one he’d used in Karno sketches. The version of the film we programmed is a recent restoration by Lobster Films and The Chaplin Project, and is as complete and sharp as possible without the use of a time machine. While accompanying the film, sitting several yards (or meters) from the screen, something — actually someone — caught my eye during the build to the picture’s frenetic chase. There is a shot inside a woman’s bedroom about three-quarters of the way in. She (and the camera) are by a window looking out, and we see a bunch of people gathered below, responding to her cries for help. One of them runs into the group of rabble-rousers, and he stood out a little to me because of his white suspenders. He’s also larger than the others in the group. It was Roscoe “Fatty” Arbuckle. It’s not a detail you’d normally pick up on. But as is my habit, my eye was going from Emma Clifton to the people out the window and back. Just in case someone down below was about to do something that would take the panic in a new direction. Last night, after I got home from the show, I found a copy of the restoration on YouTube, found the scene, and confirmed what I remembered. Steve Massa has seconded the identification, noticing that Arbuckle is dressed for Twixt Love And Fire (1914) which Keystone released two weeks after Making a Living. Steve was able to refer to a production still that he has from the film to match the outfit. 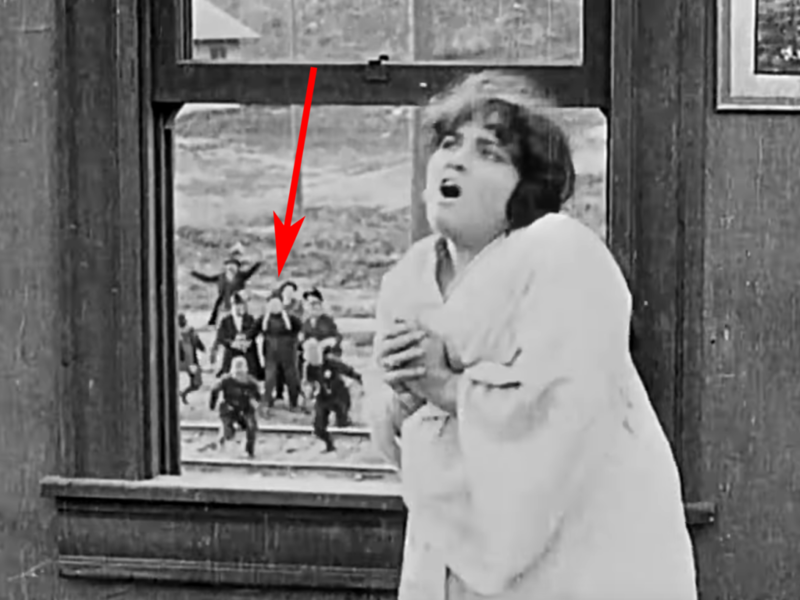 The Chaplin short’s been around forever, but the formerly lost Arbuckle short was recently discovered. There is a 35mm preservation of it at Library of Congress. Most probably, director Henry “Pathé” Lehrman rounded up anybody on the lot who was between set-ups and corralled them into this shot. If only those computers they have on cop shows that sharpen blurry surveillance video in ways that are completely implausible were real (“Why, that perp on Mars isn’t drinking a Dr. Pepper, it’s a Mr. Pibb!”), perhaps we could identify the rest of the group. 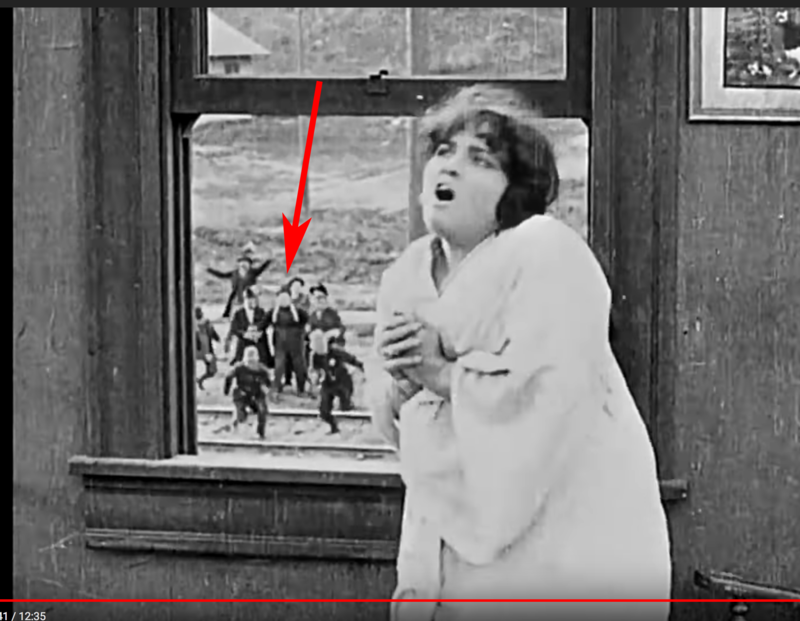 Given who was on the Keystone lot at the time, I wouldn’t be surprised if Edgar Kennedy, Chester Conklin, Al St. John, Harry Gribbon and even Charlie Chaplin himself were in the far end of that shot. “Fred Karno’s Army” screened at MoMA Sun Nov 25 at 4:30 and screens again Friday, November 30, at 7:30. The Chaplin at Keystone multi-disc set is available on Blu-ray and DVD from Flicker Alley.